April 29, 2010 by Ken Ward Jr.
West Virginia Gov. Joe Manchin has scheduled a press conference for 11 tomorrow morning to announce a major grant toward funding construction of a new Marsh Fork Elementary School in Raleigh County. 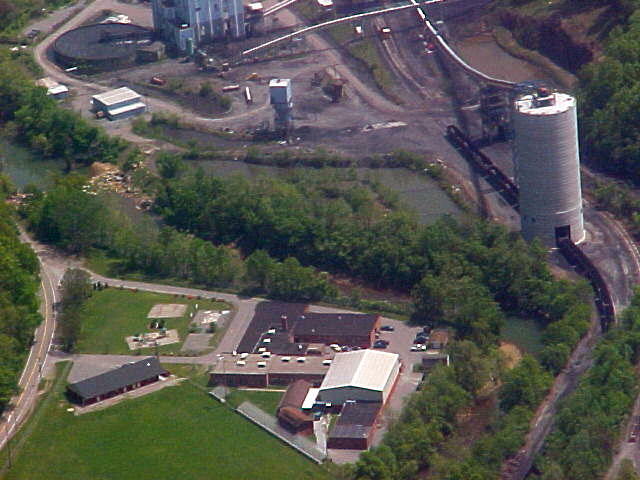 The Annenberg Foundation has offered the $2.5 million to help build the school, a move that would get students, faculty and staff away from the adjacent Massey Energy coal-processing plant and the huge Massey slurry impoundment that sits just up the hollow from the school. UPDATED: Here’s the link to Gov. Manchin’s press release, announcing that additional contributions from Massey and the local school system will reach the amount needed for the new school. A person familiar with the offer said Mr. Annenberg learned about the school when he came to the area following the Upper Big Branch accident, and that he got support for the project from the foundation’s board members who include family members. We’re extremely pleased and delighted with this. The $2.5 million will go a long way toward the $4 million that Raleigh County still needed for the new school after the School Building Authority awarded the county $2.6 million. Massey Energy agreed to provide $1 million and the county already had $1 million — and a smaller contribution from Coal River Mountain Watch of $10,000 — but $4 million was still needed to fund the $8.6 million project. re: Marsh Fork Elementary School Raleigh County WV. Mr. Blankenship, good will is an asset in the sale of a business or should I say, it could be. 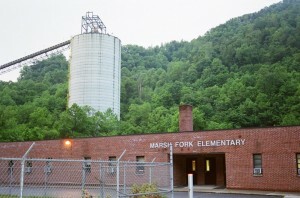 ‘Concerned parents worry that coal dust and the chemicals used in processing coal and loading it from the silo (300 yards away) onto the train are drifting onto Marsh Fork Elementary School grounds, also the school is the direct path of an earthen dam holding back billions of gallons of coal sludge in Massey’s leaking Shumate impoundment. If Don Blankenship and the MEE board of directors had any sense of corporate responsibility, a little empathy, compassion or just some common sense they would have built the most up to date elementary school in the USA for those Marsh Fork kids up the road and used the old school property for a Massey Energy Goals Coal Processing Plant ‘coal research and development center, mining science and technical school’ or if the spot is too dangerous knock down the buildings and put in some pasture and graze cows; looks like they have around 40 acres of nice flat land there. However the entire Massey Energy group, those who control it and the biggest investors are out of touch, amoral and they could care less. Their god must be cold hard cash and apparently they have no conscience nor do they care about their corporate image outside of the trading houses. Louis Moore Bacon of Moore Capital held around 6% of Massey, those who invest with him could earn around 20% a year return. He’s a billionaire hedge fund investor son of the south who owns stupendous estates around the world, a modern day king who spends a lot of time in Britain. Next to Louis Bacon stand half dozen more Massey investors of equal wealth and power. Folks like these would think nothing of spending two million dollars renovating a guesthouse of which they no doubt have many. Don Blankenship made around twenty million dollars last year too, he’s a pauper next to these big shareholders but he’s done exceedingly well for a kid from humble beginnings. Wouldn’t you think someone in the Massey public relations department could have figured out how to improve their self-image by setting up a tax deductible foundation, passed around the hat to the fat cats and cut a check to the Raleigh County School Board. The Marsh Fork Elementary School public relations nightmare would have disappeared and Massey would have been seen, as being ‘OK’. It probably would not have cost the contributors a dime, and maybe they might have made some money from some state and Federal grants. But Massey’s heart is hard; they don’t even pretend to care about the well being of the neighborhood children in this war for coal. Massey Energy would rather pay some G.W. Bush and friends related PR firm Public Strategies of Austin TX and any number of other such PR entities millions of dollars for window dressing and give back as little as possible to the region where Massey strips the land of its wealth. It would be called good will to help out the little folks from potential collateral damage in this war for coal. It’s great that Charles Annenberg Weingarten watches the evening news and just happened to hear about the plight of the children over there in coal country and sees virtue in helping the state of West Virginia in these troubled times. Thank you sir. This gift from the Annenberg Foundation while needed is really unnecessary however. Here in the 11th hour, Massey Energy can demonstrate to the world that it has seen the error of its ways and wants to begin to make things right and will now commit to underwriting the total cost of moving the school. It’s just the correct thing to do, call Lady Barbara Thomas Judge I’m sure she will agree. In 2004, Masey Energy CEO Don Blankenship contributed $3 million to the “And For The Sake of the Kids” PAC, campaigning against the re-election of West Virginia Supreme Court Justice Warren McGraw. The whole world is watching and waiting Mr. Blankenship, Mr. Inman…. Then, move Massey’s headquarters to the old school. Thank heavens! they have needed a new school, out of the way of the slurry pond, for years. I think we should go with Rob’s suggestion as well. You are right on, but has Massey ever done anything to show they give a damn about anyone who lives in Appalachia? I really thought that the press relations company for Massey would tell them to take less than 1% of their profits to match this gift. Is it up to the “environomental terrorists” (DB) to raise the money to move Marsh Fork? Again, that GOD for these environmentalists. Without them, nothing and no body would be left in the coal fields. If you check around, Massey and Blankenship do give money to groups, but they prefer to make their gifts where they’re more visible, and where better quality people can see the results. Money to Marshall, to ALEF, to WVU and WVU-Tech. They sponsor sports and science school events. Paying for a new school would be smart, but it wouldn’t get them the kind of long-lasting PR they want, the kind that comes back into the public’s eye year after year. The kind that gets seen in Charleston and in Washington. Where are Friends of Coal? I have heard nothing from Hank Williams, Jr., and the others who were at that big party Massey and Friends of Coal gave here a while back. I don’t read anything from Massey or any Friends of Coal saying anything. Why aren’t they saying something about the tree huggers shutting down their mines. The big guys are doing that now, and will continue to do so until something is done to stop all these miners from getting killed. Let us not forget the 11 workers that were lost when that oil rig exploded in the gulf. I think it is great that unlikely people all worked together to help build a new school. The Annenberg Foundation is about communication and maybe the results of the villian, Massey and the state government and local board and national philanthropies worked together showed how people can be at each other’s throats, but do the right thing.